Prayer is a powerful tool in the arsenal of a believer but sometimes we forget just how mighty it can be. In fact, at times when life is going along just fine we can neglect our prayer life, and when the heat turns up then, we are quick to realize that we have a source to Whom we can turn. Hopefully, that’s not true in our case, but it sometimes happens when our life is rocking along pretty well. God’s Word is chocked full of sound advice, effective principals for life, and great promises. We just have to be open to searching them out. You just might be surprised at how relevant it can be to life even in the 21st century. Now I have prayed the Word for some years, but recently I am realizing that even so, I am underutilizing it in my prayer life. For example, I was praying for a friend this morning who is seeking the Lord about some decisions. I ran across a scripture that I found to be very helpful. I know when I am asking the Lord for something; sometimes I find it hard to know the difference between Him answering, my thoughts and other thoughts and ideas that ‘pop’ into my head. I ran across this scripture this morning and felt prompted to pray it over my friend. The focus scripture was My sheep, (my followers) hear My voice and they follow me. The voice of a stranger, they will not follow. Based on these words, I felt compelled to petition the Father that this is His child I am praying for and that they are diligently seeking His wisdom. So my prayer went something like this: Lord, I pray (their name) will clearly hear Your answers for he/she is Your child and Your children (sheep) hear your voice and Your Word says that the voice of a stranger they will not follow. I pray that Your voice will be clear to (name) and that all others will be silenced so that he/she clearly hears what You alone have to say to them. From there, I went on to look up appropriate scriptures to pray over my friend’s current needs. What is an excellent way to pray for others or yourself! You might ask why? Why is praying the Word of God relevant? Isaiah 55 tells us in verse 11, “My word, which comes from my mouth, is like the rain and snow. It will not return to me without results. It will accomplish whatever I want and achieve whatever I send it to do.” Now that sounds like another promise we can count on; we just have to remember it says that it accomplishes what He wants and achieves what He sends it to do. That means we must pray the promise within the context it is written and with the right motives. “What is the source of wars and fights among you? Don’t they come from the cravings that are at war within you? You desire and do not have. You murder and covet and cannot obtain. You fight and war. May the God and Father of our Lord Jesus Christ grant you grace and peace! Whether you have experienced the best Christmas and New Years ever or struggled through every single moment since Thanksgiving; I want to bring you some encouragement! New Years brings a lot of pressure to many of us. We are challenged to make life changing resolutions. Buck up, loose that weight, eat healthier and get those lab numbers down; give your work everything you’ve got…you know that promotion is coming available; fix that broken relationship, or maybe even work on having the mind and character of Christ. We see the beginning of a year as a chance for a new beginning; a time when we have a fresh start. Then the pressures begin. Sometimes from others, but most often we exert the most pressure! Have you ever noticed that many times we can be our worst enemies? Have you ever suffered from unrealistic expectations that you have placed on yourself? Boy have I! The problem with resolutions is life often gets in the way, and we often give up quickly because it seems almost impossible. The truth of the matter is what we are facing is called predictable resistance. If you are addicted to soda, whether regular or diet; have you ever tried to give it up? The predictable opposition is that if you’re like most, you will almost immediately begin to have cravings for what is missing. Same goes for sugar or other addictive or habitual activities. These are the things that are the enemies of our success. Maybe you are trying to find resolution in a relationship, but the other person isn’t ready to cooperate. No matter the situation, predictable resistance is always willing to meet you as you battle to accomplish your objectives. I hear you, so how is that encouragement? That’s pretty discouraging. The first step in overcoming and being successful is knowing where the battle is and how to fight it. Now if you’re new to the blog, let me begin by explaining that I am a believer in God, Jesus Christ and the power of the Holy Spirit. You may or may not agree, and that’s just fine. However, I would just like to encourage you that there is power to reach your goals, be successful in your resolutions, and for me, I am seeking a revolution in my thinking in 2017. Too many times I have let the enemy and others steal my resolve. The truth of the thing is, we don’t battle people-it is a deception of the enemy of our souls that people are our problem. We have an arsenal of weapons and depending on who you ask; anywhere between 3000 and 8000 promises available to stand on in the Word of God! That’s pretty powerful! The thing is, are we aware they exist? Are we motivated to see if any pertain to our situation? Do we have the faith to believe they are available even to us? These are all questions I wrestled over in the past and let’s face it sometimes I still do! We all have times of weakness when we feel beaten down and just want it to be easy. We also have an enemy who does not want us to realize who we are in Christ. He doesn’t want us to understand God’s love for us or how much is available to us if only we believe! So here is the thing: the enemy has tried to stall my writing, my study time and placed objects in the way of my thinking. Is it his fault? Not really, he can’t accomplish it without my cooperation! It is time this stops. If satan wants a revolution, it is time that I picked up that arsenal again and defended these things I know the Lord desires to see in my life knowing that God will be right there giving wisdom, inspiration, and hope along the way! Hopefully, I will be able to share with you the steps He shows me along the path and share some of the wonderful promises available to those who believe! and seeking Him in His temple. We have now spent ten days focusing of the Grace of God. I don’t know about you, but His grace never ceases to amaze me! Sometimes it seems to show up at the very last possible moment, just when you think you can not make it another day or another step. Other times it comes suddenly and unexpectedly. Sometimes it comes before you even realize you need it; or right in the midst of something; then He reminds you… remember, I have already made provision for that. I don’t know about you, but sometimes for me grace can be as simple as a glimpse of a rainbow that brings a big smile to my face and child-like joy and wonder in the middle of an ordinary or complicated day. “Why is that grace?” you might ask. These are just a few examples of things I just delight in: a rainbow; a beautiful cardinal or blue bird that lands on the rail of my back deck unexpectedly while I am studying or writing; a child’s laughter or children running and playing; a beautiful sunrise or sunset; a beautiful blue sky filled with fluffy clouds that form all kinds of shapes gently blowing over my head. Again, “why?” You see, I am one of those people (you might know one or be one,too) whose mind runs constantly full speed ahead and rarely slows down or takes a rest from thinking. Seriously the wheels are always turning! Even in my sleep, I have vivid dreams. It is always nice to get unexpectedly surprised by one of these grace moments when the glory of God shows up and my mind just takes a few moments to pause and relish in the moment of glory rather than rushing around and missing them. His glory is all around us if we just take the time to notice! The scripture for grace today is a prophetic word from Zechariah found in chapter twelve. It is a prophecy for a future time. Commentators aren’t completely in agreement or completely convinced when it will take place but let’s look at it anyway and then we’ll talk about it just a little. I don’t know about you but the Spirit of grace and supplication seems to refer clearly to the Holy Spirit because He is the one Who draws into belief in Jesus, the One they pierced. This gives us a good indication that the prophecy takes place in the future and after the time of Christ’s birth, death, burial and resurrection. Other than that, it could be hard to pin point. Many believe that this referred to the time in AD 70 when the Romans sieged Jerusalem and the second temple of the Jewish people was destroyed. Still others believe that it is a future event, and some believe it is a double prophecy depicting both. Since our focus is on grace and the Spirit of grace (Chen, meaning grace, favor, charm, elegance and acceptance) and supplication ( Tachanuwn, meaning supplication, supplication for favor with God or man); I think we can say for certain that this prophecy would take place after Christ’s return to Father God’s right hand and after the day of Pentecost when the Holy Spirit was given to all believers in Christ. AD 70 seems like a definite fulfilling of this prophecy, because there certainly was great mourning in the land over the loss of their homeland and the loss of their temple. Will we once again see it fulfilled, in our lifetime or the future? Who can say but our gracious God. This I do know, both from personal experience and based on the history we have traced over the last week and a half: God has this and He will provide His people every ounce of grace and mercy needed if there is yet another fulfilling to come! His grace is sufficient for everyone; His love is unending; His mercy endures forever; and He is enough for any and every situation that we face in our life! Skeptical? Just give Him a try! He is who He says He is! He is faithful even when we doubt Him and when we are not faithful. His promises are true even when they are not in our timing and His timing is always right on time because He sees things from a much bigger perspective than we do. In every trial, difficulty or loss that I have experienced in my life, He has proven this true. It may have taken more time for me to see it than I would have liked, but never-the-less it is true! Today’s Bible reading passage in the plan I am using is Isaiah 54, or at least I thought it was… until I looked later and found I jumped ahead a chapter. Perhaps I was subconsciously eager because it is one of my many favorites in Isaiah. It is right on the heels of another favorite, Isaiah 53 which is the prophecy of the coming Suffering Servant, Jesus Christ. There are great promises for Israel in this chapter, I personally believe there are lessons for the Christian also in these words and perhaps some of the promises apply to us as also. Based on Galatians 3: 13-14 “Christ redeemed us from the curse of the law by becoming a curse for us (because it is written, “Cursed is everyone who hangs on a tree ”) in order that in Christ Jesus the blessing of Abraham would come to the Gentiles, so that we could receive the promise of the Spirit by faith. For all of you who were baptized into Christ have clothed yourselves with Christ. There is neither Jew nor Greek, there is neither slave nor free, there is neither male nor female – for all of you are one in Christ Jesus. And if you belong to Christ, then you are Abraham’s descendants, heirs according to the promise. (Galatians 3:13, 14, 27-29 NET). The first attention getter for me was verse two. It says to enlarge your tents, spread out the wall, stretch your boundaries. Then one translations says don’t hold back; another says spare no effort; and lastly another says spare no expense. It goes on to say lengthen your ropes and pound your steaks deep. Many commentaries agree that this refers to the time after Christ when the gospel would be shared with both Jews and Gentile. As I considered the passage this morning I felt impressed that it could also be very applicable in my life and the lives of others. Maybe for our day, it is saying make room for God and all that He desires to do in our lives. Make space for Him, for the assignment He has for our life, and for the blessings He wants to give us. Be diligent and prepare even when it may seem nothing is actually happening right now. Keep trusting God and being expectant of what He has planned for it will come to pass in His timing. His timing is always perfect and right on time. His plans for us are good, believe and trust He is for us! Don’t be afraid, for you will not be put to shame! Don’t be intimidated, for you will not be humiliated! You will forget about the shame you experienced in your youth; you will no longer remember the disgrace of your abandonment. (Isaiah 54:4 NET). Trials, troubles from the past that cause shame will no longer haunt you, they will be forgotten was my next big take away. We all have an experience or two in our lives that haunts us, one we want to forget. That is exactly why Jesus came (Isaiah 53 & 61:1-4) to bear our sickness, disease, sin and shame. Also He came to encourage the poor, heal the broken hearted, bring liberty to captives, freedom to prisoners, and relief and joy to those who mourn! We are neither limited nor do we have to be defined by our past, we can move past the things that shamed, intimidated, humiliated and held us back in the past! Though the mountains move and the hills shake, My love will not be removed from you and My covenant of peace will not be shaken,” says your compassionate Lord. (Isaiah 54:10 HCSB) Our Heavenly Father loves us and nothing can change that. Those In Christ have been given right standing with Him. His love is unwavering and His covenant of peace will not be shaken! I also love verses thirteen and fourteen, that our children will be taught of The Lord and prosper and that we can live oppression free and far from terror. Followed up by: ‘No weapon forged to be used against you will succeed; you will refute everyone who tries to accuse you. This is what the Lord will do for his servants – I will vindicate them,” says the Lord’. (Isaiah 54:17 NET) I certainly am no theologian, just a simple follower of Jesus. One who, based on many experiences in my own life, has witnessed the goodness of God and His promises in even the toughest of times and the loss of some of the people dearest to me. I can attest to His great love, His mercy and grace in the hard places in life even in the times He seems absent or silent, He is there working, loving and watching over you. May you be blessed this day and may His goodness and mercy follow you! How fascinating when several avenues in our life converge and it results in a new understanding of who we are or of who we are meant to be, when they come together and totally change our perspective or our trajectory. Lately, I have been emerged in a study of Gideon, a Biblical hero of faith listed in the book of Hebrews. He did not start out that way! When first mentioned in Judges, he is hiding in a wine press threshing wheat. This is a very unconventional place to thresh wheat but Gideon is hiding in order to protect the wheat from the enemy who is oppressing his people. Meanwhile he is visited by an angel of The Lord with this message, “the Lord is with you, mighty warrior!” From our perspective, Gideon is fearful and hiding; from God‘s perspective he is declared a mighty warrior (Judges 6:11-12); and finally from Gideon’s perspective he is the weakest and the youngest (verse15). Whether we like it or not so is our lives. People see us from one perspective, we see ourselves from another, yet God sees us beyond those perspectives. He sees us for who we are, who He created us to be, and our unlimited potential in Him. I don’t know about you but I am not that different from Gideon. I tend to be hard on myself and to be insecure, though some have said they see me as confident and strong, I rarely qualify. They only see the outside, my actions and have no idea what is in my heart unless I share it. Again, from God’s perspective, He sees the real me, the good, the bad, and the ugly. He also knows the destiny He created me for and the potential that I have, especially if I walk with Him. He has a plan and purpose for us; he also allows us free will to choose what path we will take. Imagine our lives as series of roads, for this purpose we will picture if we can three roads. One is a beautiful road with flat places shaded by the covering of pretty trees at times, further along it meets with fields of flowers, rolling hills, and even the rougher terrain along the way is beautiful and pleasing to the eye. We will call it God’s Grace. The next road is direct and straight for a long-span, it divides and goes different directions at a certain point and from there tends to meander and wind at times. It’s name is Circumstance. 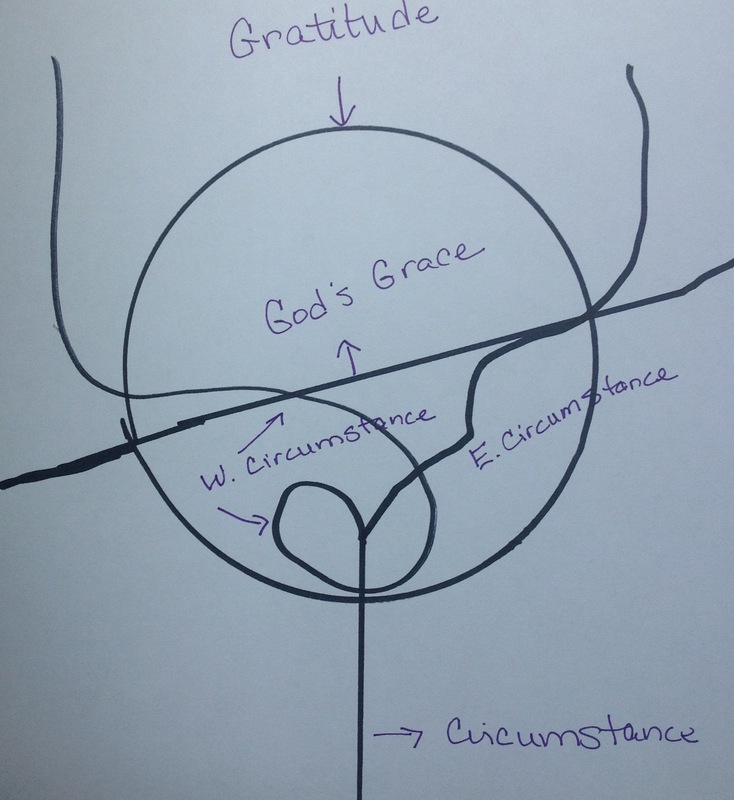 The last road is a perimeter like roadway, each of the other roads intersect with this road at some point and this road ALWAYS circles back to God’s Grace. This road is called Gratitude. All of these roads intersect each other at different places and each has an impact on the other. Our lives are often lived in our circumstances. We are walking or driving along straight and smooth, something happens, a bump in the road, a sickness, or a tragedy and we are at a fork in the road. Which way will we choose to go? Will we go with the west fork or the east fork? For those of us who know God and have trusted Jesus, will we trust His promises? Will we see His grace and allow it to take us to gratitude? Will we take a turn on gratitude, knowing He is good and trust Him until we reach the path of God’s Grace. Will we possibly take the more winding path of West Circumstance taking the long way to God’s Grace and eventually finding our way to Gratitude. There is also the option of just staying on the road of our circumstance, east or west and continuing on their long paths and totally miss God’s Grace and Gratitude. For me, I have chosen different options including the absolute longest roads back to His grace and to gratitude in a few cases. Trust me that one is not a healthy one! After many trials and troubles and tragedies it is my desire to take the shortest, straightest route to see Him bring grace and glory from both the good circumstances and the bad. Do I want difficult circumstances? Are you kidding me, no! Can I give thanks in a hard time? Maybe, maybe not. Can I believe that despite tragedy God is always good? Yes, He has proved it again and again. Can I believe He can take the worst circumstance and bring something good from it or despite of it? Yes, I have seen it and personally experienced it. I write this today with a broken heart. Our small town has experienced tragedy today. While I was writing this, a wonderful man, a friend that owns our local jewelry store was viciously gunned down as four males decided that their desires and wealth or lack of was more valuable than his life. Three of them are on the loose. Tragedy!!! Heartbreak!!! Be assured, this does not change God’s Goodness!! This is a product of a fallen world and a culture that has come to value things and use people, a culture where wrong is accepted as right and right is judged as wrong. We can not blame God for these things when we are the ones who choose our own paths! We can strive to make good and right choices and teach others within our influence to do likewise.